Traditionally, if a Facebook user messages someone outside his or her network, the missive gets sent to the "Other" mailbox -- a rarely checked purgatory most users don't even know exists. It's a practice intended to protect users from a spam deluge. Facebook said in December that it would begin testing out paid messages, allowing users to contact people with whom they have no direct connection in return for a fee. Facebook didn't say at the time how much it would cost, but the answer turns out to be "a lot." Mashable discovered on Thursday that sending a message to Facebook founder Zuckerberg carries a $100 price tag. That's also what it costs to message Facebook COO Sheryl Sandburg , CFO David Ebersman, and several other Facebook members CNNMoney tried, such as Digg founder Kevin Rose. 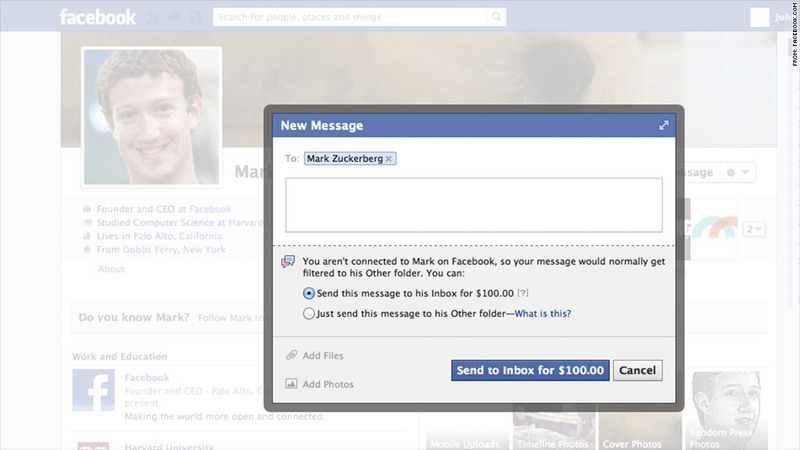 "We are testing some extreme price points to see what works to filter spam," a Facebook representative told CNNMoney. Ahead of the holidays, Facebook (FB) launched "Facebook Gifts," allowing users to purchase real-world gifts for their Facebook friends. In October, the social network started testing out a "Promote" feature that lets users pay $7 to broadly broadcast important pictures or announcements.